I strongly believe that Mobile Education is one of the most underutilized use case of Mobile Phone. Given the ubiquity of cellphone in India and comfort most of us have with Mobile Phone.Its only natural that it should be a preferred medium for providing education to masses. But sadly most of my friend confuse Mobile Education with what they see on Idea Cellular commercial . That is no doubt a nicely done and inspiring commercial but current state of Mobile infrastructure doesn't allow for a Mobile Only Distance Education as shown in the commercial . I think that for near foreseeable future Mobile will be an tool to supplement traditional Education . Education will be mobile enabled , Mobile assisted but its unlikely that its going to be Mobile Only anytime soon. So given these constraints there are few use cases for Mobile Education in Indian context ,TATA Indicom's English Seekho is one such initiative where end user can learn conversational English utilizing Voice as a delivery medium. I am aware of some SMS based services for Word power and other such things .Zyebo from Visual Mobile is another such application which serves a niche in mobile education . Zyebo provide Q&A based educational service for competitive exams and Quizzes using GPRS as a delivery channel. Zyebo is available for free download on the deck of all major GSM Operators in India .CDMA Phones are not supported yet . To download Zyebo without going through Mobile operator you need to point your mobile phone browser to http://www.zyebo.com/app.Once you connect successfully, you will be asked to enter your mobile phone number. The Zyebo download will now start on your phone after you have keyed in your mobile phone number. You can also get download link by sending "ZYEBO" as an SMS to 58558 . Size of Application was 176KB and it took less than a minute to download it on My E63 .Installation was a single step process without the need of any registration . Zyebo uses your cell number as a unique identifier. You have an option to provide additional details like Name, Email Id etc later on. Zyebo is not a free product , it works on a Try and Buy method. they allow end users to try out sample of content in each category and present an option to subscribe to it on daily , weekly and monthly basis . Current list of Offering include Quiz from Derek O Brain , Britannica Trivia Challenge, Bollywood Quiz, Logical reasoning etc .I believe that additional categories will be added from time to time . As a Quizing enthusiast I tried Trivia Challenge on Zyebo. User interface of product is simple and minimalistic .Work flow was very intuitive. 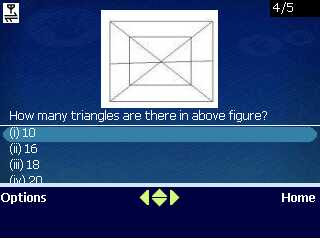 you can traverse list of multiple choice questions with the help of Left and Right Arrow keys and scroll up and down between various answers using UP and Down arrow key . I was impressed by the quality of questions.I was able to answer only some of the questions right so to improve my score I end up subscribing to monthly pack of it. In my opinion Best Thing about Zyebo is not its Technology . I am sure that can be replicated . It not User Interface , Its clean and intuitive but its not wow . Their USP is not Content either, because most of their content is syndicated . Their USP is distribution and pricing . A product like Zyebo is essentially a subscription service over mobile . with their presence on all the leading operators the distribution piece is in place . their granular sachet pricing for Daily , weekly and Monthly subscription enable end user to experiment with product . I am sure that after using daily and weekly packs most of the users will upgrade to Monthly packs. As of Now content available on zyebo is primarily targeted to Enthusiast and maybe Civil Services aspirants but I am sure that going forward they will be including IIT,PMT and other exams in their offering. given the limited spending power of that customer segment Zyebo's sachet pricing will be a real differentiator for them . I am sure their team is working on that. I look forward to getting more content on Zyebo and improving my score on Trivia Quiz. I will keep you posted on both . Do try out Zyebo and let me know how you feel about it? Most of the use case of mobile web revolve around the idea of providing actionable information. The information which help us to decide and Act . information which is often answer to the basic question like WHO ? What? Where ? Why and How ? .Two of the hottest start up in silicon valley Loopt and Twitter has their genesis in a simple insight that most frequently asked question on mobile phone is Where are you ? and What are you doing? .Most of the business in mobile web originate from a simple insight like these.These are just two of many actionable information which can be consumed over mobile phone. Information like Which movie is being showed in neighborhood multiplex ? Which are the cool gigs this weekend ? Whats the stock price right now ? is there a car service station nearby ? how can i pay my utility bill? etc . Mera Mobi from India Interactive Technology is a product which is trying to fill that niche by aggregating such information and presenting it to end user in an actionable form . Mera Mobi is available for free download from www.meramobi.com . All you need to do is to enter your cell number and you get a download link via SMS. Outside of iPhone, MeraMobi app is supported for most of the mobile devices available in Indian market. You can look for your device here .I tried it on my Nokia E63, Sony Ericsson W200i and Nokia N77. with installation file size is of 269 KB it downloaded easily over GPRS connection.Installation went smoothly. Functionalities of Mera Mobi are grouped under broad categories like Transaction ,Information ,Entertainment etc. They keep appending new sections to the list from time to time .Mera Mobi's strategy is not to create content them self .Content in most of the categories is syndicated from other sources.News and Movie review section is syndicated from DNA .Yellow Pages are powered by Infomedia18 . Job search is powered by Naukri.com . Movie Booking is facilitated by Bookmyshow,Astrology is powered by Ganeshaspeaks, Bill payment is powered by billdesk.I tried these services and results were satisfactory. long process spread across 10 screen . 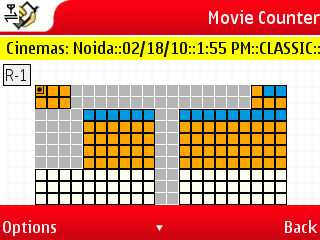 you can even choose your seat using the visual representation of seating arrangement . As a power user I was little frustrated by too many screens but on the hindsight its a seemingly good design choice because MeraMobi is primarily targeting those user who are not very familiar with Internet so their work flow has to be fail safe. I also checked the work flow for paying bills such as electricity bill, telephone bill, mobile bill and broadband bill along with charity to Siddhi Vinayak Temple.MeraMobi does not charge anything additional over and above the actual cost of any transaction service. Payment for transaction services can be done through Visa and Master credit cards. security of transaction data is ensured by using HTTPS . To avoid misuse of credit card info in case of theft and missing phone, application don't store credit card detail on device by default and every transaction is protected by a unique PIN. Most of the products reviewed on Lab Report till now were feature products . which do one thing only and do it well .These product cover their niche in depth (functionality ) and breadth ( variety of source ) . Mera mobi is in contrast of them . this is more like a Swiss army knife approach . where a lot of commonly used features are bundled under a single app and provided to an audience stretched across demography . Its very likely that most of the user of Mera Mobi will be using only a fraction of available functionalities. this presents very unique design challenge . You can't make any assumption about user.Your work flow should be intuitive and fail safe .Memory foot print should be small enough to run on legacy phones and architecture should be such that you can add new categories and services later on by a simple upgrade . Real challenge of a mass market product is to achieve all this functionality without compromising on simplicity and easy of use . On that yard stick MeraMobi has done a decent job .Moving forward I would love to see things like indic language support and integration with operator billing . this I believe will greatly enhance the value proposition of Mera Mobi. Do give it a shot and share your experience with us . Continuing with the theme of Mobile Social networking on Lab Report .Today I am reviewing Rock talk. Rocketalk is a Mobile social networking application developed by Delhi based onetouchstar corporation . Rocketalk combines video, pics, voice and SMS into one clients. This is essentially a one- stop solution for all your communication need . I can see some readers of Lab Report clinching their teeth and saying "Yet another IM integrator " . Well ….Hold your horses guys. I agree with you that its a crowded market place with a dozen or so application who claim to do the same thing . So why I choose to review Rocketalk today ? Because I believe that there are some interesting aspect of this application , both in terms of design as well as user engagement tactics which holds some valuable lesson for everyone interested in Indian Mobile app space. Rocketalk is available for free download at http://www.rocketalk.com/get_it_now.php .With 1200KB in file size it was a little difficult for me to download it over a weak GPRS connection so after two failed attempt , I resorted to downloading the sis file on my PC and side loading it on to my Nokia E63 via Bluetooth .Installation was glitch free . With just three screen and couple of entries I was ready to roll . Rocketalk offer all the functionalities of regular social network like adding friends, Instant messaging , sharing photos & video, comments on friends activities etc . you can create your own group around any topic .there is an option of showcasing your content in public zone , accessible to every rocketalk user .there is a content mall by name of Fun Zone where you can download syndicated content provided by rocketalk partners . All these functionalities are very nicely implemented and are easy to use.One differentiating factor for rocketalk is of Voice messaging and adding voice description to your profile . Voice based communication is deeply integrated with rocketalk . Which is a very good thing because text input on most of the phone is still less then user-friendly. I added a voice introduction to my profile and exchanged few voice messages with users (rocketalkers) my experience was satisfactory. However on some screen there were voice coupled advertisement banner .where ad message starts to playback the moment you load the page. Although it amused me initially but I am not sure how seasoned rock talkers would feel about it ,its very much possible that some of them might find it a little annoying . Experienced Mobile app user will notice that RockTalk’s approach to user interface is different from other applications . While most of the other applications have a menu driven workflow , Rocktalk on the contrary have a Tab driven workflow . it’s a very smart design choice because it allow user to switch context quickly . just by a single key press you can move from Fun Zone (syndicated content ) to Gallery (User generated content) to IM. This foster higher engagement, page view and of course more ad impression. a win –win thing for all parties .I always maintained that menu /list driven long vertical pages were a hangover from WAP . Tab based browsing is an elegant solution for App centric paradigm .No wonder cutting edge application like opera mini are also shifting to tab browsing. When it comes to creating user engagement , developing community ,observing user behavior and seeding conversations ,Rocketalk has been a case study for me. They have done some very interesting campaigns for their advertisers like. Radio Roaketalk is a user generated show where you can find expert advice on topic like stock investment , Music , Car purchase etc . These shows are created by users them self and quality is good . currently they are running a love card contest for valentine day .these kind of activities foster a high level of user loyalty .I had a word with Sameer Agarwal from Rocketalk team .He mentioned that they will be coming up with few more such campaigns in days to come .so expect more on this front . May be I will do a separate post on such campaign in India. With High user engagement , India focus and right distribution partnership, things seems to be going good for them .It will be interesting to see how it shapes in months to come.Do try out Rocketalk and let me know what you think of it .